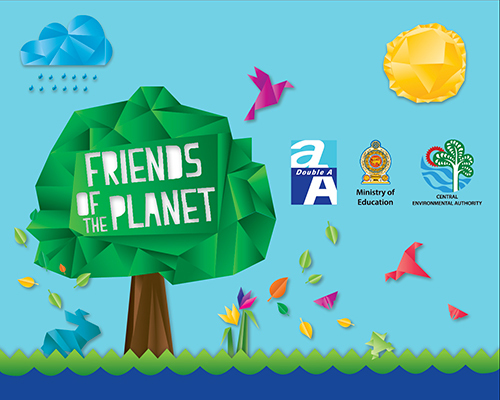 Colombo, Sri Lanka, May 26, 2016: Double A has reached the final round of the ‘Friends of the Planet’ project launched in collaboration with the Ministry of Education and the Central Environmental Authority. The project aims to create awareness among secondary school children on the growing impact of climate change and encourage them to come up with fresh and creative solutions to help solve today’s problem. “We were pleased with the overwhelming response we received. We believe in the power of our children. They have the capacity to understand solutions to big problems and even more crucially increase awareness of how imperative it is for everyone to join the effort to save the planet. Students with their fresh ideas and thirst for innovation are crucial stakeholders in a new way of life that will help save the planet. Judging from the success of this particular campaign, our belief in young minds was well founded,” commented Thirawit Leetavorn, Senior Executive Vice President of Double A. Initially, in line with the campaign guidelines, the competing schools each selected a team of five students above the age of 15 to come up with a cost-effective and ground-breaking solution to an environmental problem. Under the guidance of a teacher, each team developed and implemented a project within a period of three months. On completing the project each team compiled a detailed report which they presented to the expert panel of judges from Double A for evaluation. The panel selected twenty-five successful team projects which proceed to the next level with the provision of Double A papers. These twenty-five projects were evaluated by an expert panel consisting of representatives from the Ministry of Education, the Central Environmental Authority and Double A, who then shortlisted the seven most relevant and successful projects. These seven projects qualified for the final round of the ‘Friends of the Planet’ programme. The top seven projects are from Ibbagamuwa Central College, Viharamahadevi Girls College, DS Senanayake Central College, Mayurapada Central College, Pallivasathurai Maha Vidyalaya, Royal College, and Vincent Girls High School. The ultimate winning team will be given tablets and an all-expense-paid trip to Thailand where they will see an award-winning sustainability project carried out by Double A. The ‘Paper from KHAN-NA’ project is a landmark effort to make optimum use of agricultural land. It provides an additional source of income to Thai farmers and helps resolve environmental issues in Thailand. The 1st and 2nd runners up will receive valuable tablets and certificates.